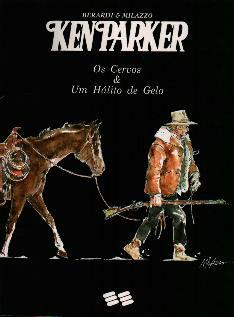 Beginning in November 1978, Editora Vecchi started publishing Ken Parker in a 13.5x17.5 format. 53 numbers in the series were published until August 1983. In January and February 1990, Editora Best News published numbers 54 and 55 of the series. 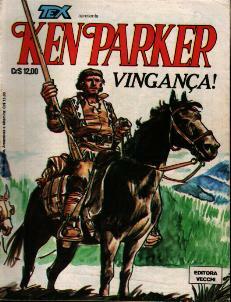 Brazilian readers, therefore, were never able to read the last four numbers of Ken Parker. In fact, in Italy the series was cancelled with number 59. In 1994, Editora Ensaio published a special issue in large format (20x27 cm) with two stories: "Os cervos" in color ("Pups" in English) and "Um Halito de Gelo" in black and white ("An Icy Breath"). 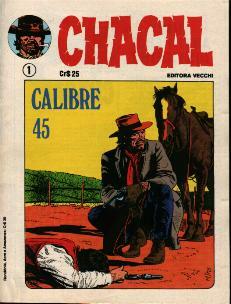 In 1980 Editora Vecchi published a series in small format entitled Chacal. Actually, this series corresponded to the Italian character of Judas. From n. 17 through n. 24 the Italian "Alan Scott" was substituted by "Toni Carson". In 1989, Judas reappeared under Editora Record with its original name and format.